Peak bagging (also hill bagging, mountain bagging, Munro bagging, or just bagging) is an activity in which hillwalkers and mountaineers attempt to reach the summit of some collection of peaks, usually those above some height in a particular region, or having a particular feature. Peak bagging can be distinguished from highpointing. In peak bagging, the targets are the peaks of mountains or hills, and the popular lists usually require that the target pass some threshold of prominence. In highpointing, the goal is only to reach the highest point in some geographic area (e.g., county, state, or country), whether or not it is a peak. I could have written something, however, that sums it up best I think. Let me also state that historically speaking, I am not a peak bagger. However, it has started to intrigue me, and I thought I would start keeping tabs on which of the summits I have completed, and, which ones I should do next as I have time available. I recently posted that I was going to start day-hiking the Appalachian Trail (AT) through Massachusetts, however, logistically speaking, it is a tough thing to do, and I would rather do multi-day backpacking section hikes of the AT (preferably with a companion, so as we can park a car at each end of the section), as it is just more efficient. So, with that plan temporarily thrown out the window, I decided to start tackling 4000’ers in New England. Not to hit them all during a season, but, over time. This Excel Workbook is broken into separate tabs for each list, and containing columns for Rank, Name, State/Rank (only on New England lists), Summit Date, Notes. 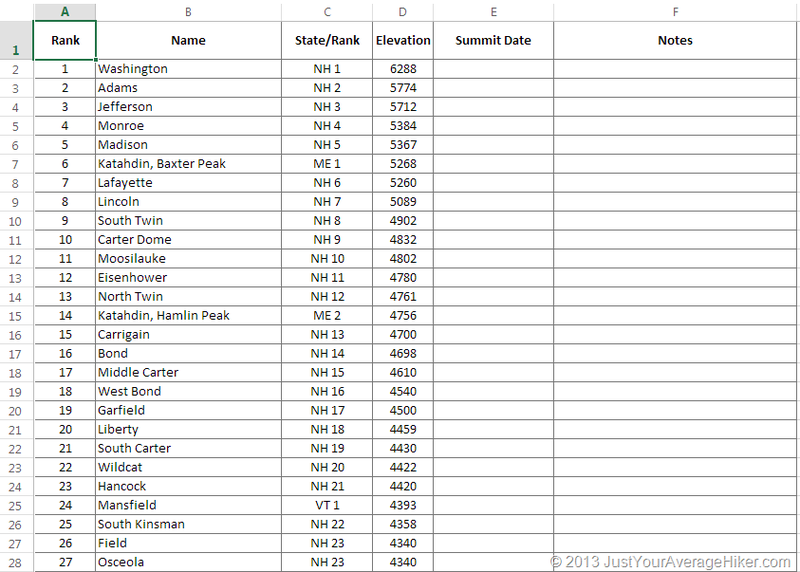 For easily tracking your summits. Click here to view/download the Excel Workbook! Please let me know your thoughts… is this useful? Should I add anything? Any other lists? Please let me know in the comments below! This entry was posted in Backpacking, Downloads, Hiking, Trail Resources and tagged 4000, 4000er, 4ker, Backpacking, download, Excel, four-thousand footer, Hike, Hiking, List, Maine, MIcrosoft Excel, Microsoft Office, New England, new hampshire, peak bag, peak bagger, peak bagging, Vermont. Bookmark the permalink.